A few more store improvements have appeared within our walls. In some previous posts, I shared pictures of work-in-progress. See, it's not just our quilts that are a work in progress! The large old box shelves that housed our batting supply have been removed. Carpenter Bob built some much improved cubby box shelves for our batting in another spot. In place of the old batting storage, we have a nice new clean wall and all our our thread has been moved across the store to that spot. 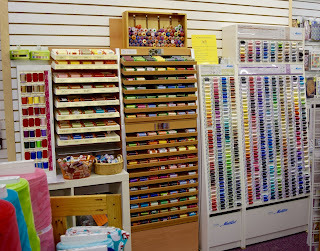 This is just a few feet away from all of the hand embroidery threads, so it can now be called the "Thread Department". Some of these stackable thread shelving units will still undergo some changes, as we get new units and get our selection more organized. 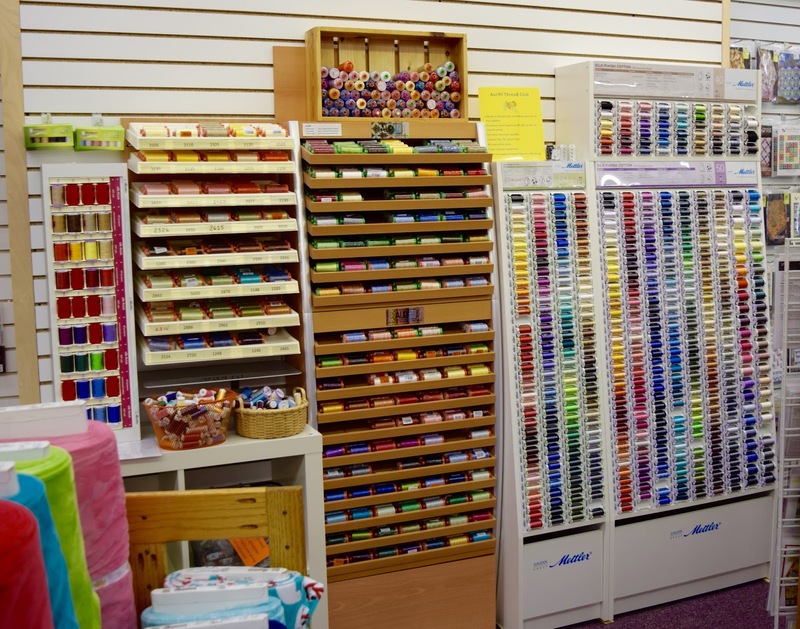 We love the Mettler and Aurifil brands! Over where the thread racks used to be, Bob has built and installed some more shelving for fabrics. The picture below was taken before even more units were added to that wall. Our dream is to have the right balance of shelving and bolts so none of the bolts have to be on the floor! Never gonna' happen! And we would be so sad if it did! 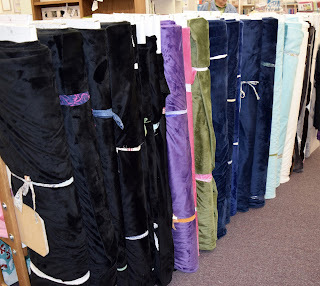 We have some new space created for our extra-wide Cuddle fabric bolts-- it's 88-90" wide, so makes a fabulous back for many quilts and doesn't need a seam! 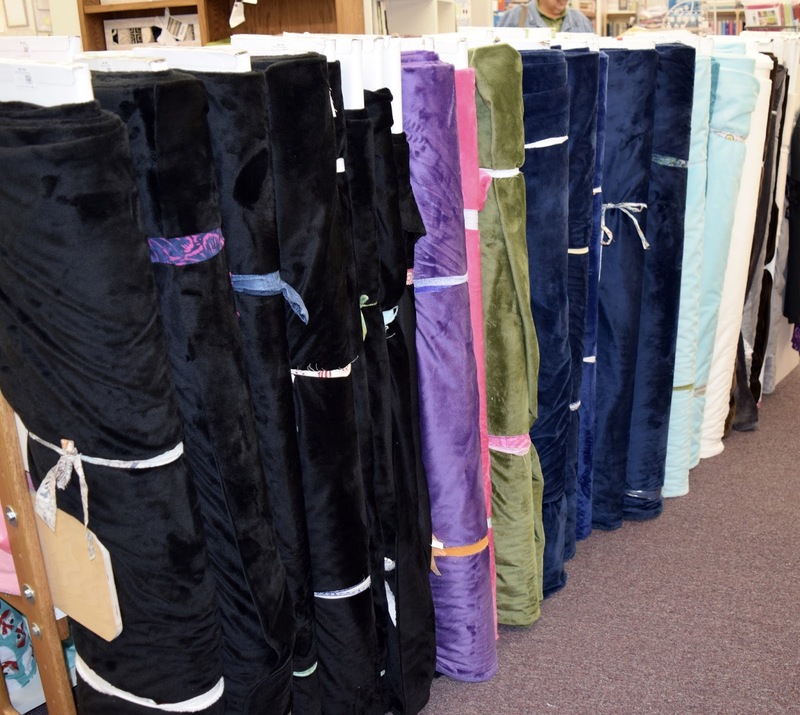 All of our wonderful cozy Cuddle bolts (58-60")! 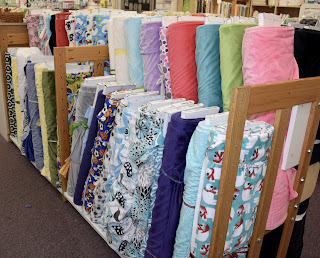 Most of the Cuddle that we sell is destined to be quilt backs, but there are lots of other things that you can make with this soft plush fabric. Click on this link to the numerous free patterns on the website that use Cuddle fabric. 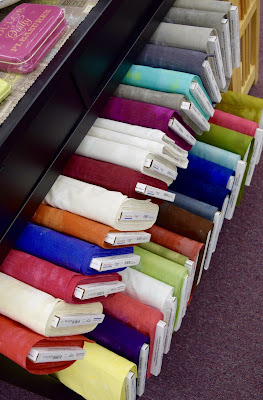 A group of new Moda Grunge fabrics on our shelves! Come in to see the wonderful shades and tones at your fingertips!